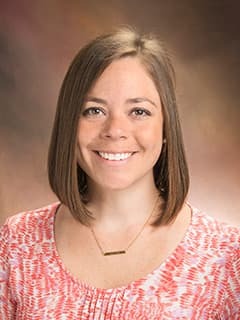 Jennifer Webster, DO, is an attending physician in the Division of Gastroenterology, Hepatology and Nutrition at Children's Hospital of Philadelphia. Webster J. “Resolution of Profound Global Delay with Nutritional Rehabilitation” in the American Academy of Pediatrics (AAP) Section on Gastroenterology, Hepatology and Nutrition (SOGHN) H-Program Handout, H3021 - Considering Failure to Thrive in Your Patient: So much to think about, so little time. AAP National Conference and Exhibition (NCE), Chicago, IL, 2017, pp. 48-49. Webster JB: Pediatric Preventative Medicine in Early Childhood. Encyclopedia of Primary Prevention and Health Promotion: Edition II. Gullatta TP, Bloom M (eds.). Springer US, 2014. Webster J, Christopher O. Pediatric Preventative Medicine in Early Childhood. Encyclopedia of Primary Prevention and Health Promotion: Edition II. Thomas Gullata, Martin Bloom (ed). New York: Springer, 2014.